Are you looking to start an online shop? Perhaps sell fashion items like T-shirts, shoes, dresses, and what not? If you feel like the market is already saturated and you’ll be fighting a ton of competition, may we suggest selling bags instead. Tote bags, to be precise. The tote bag market is not a bad area though. It’s been steadily growing over the past few years. So if you need tote bag mockup templates, check out what we have in store for you here. Want to earn extra money? Perhaps an additional source of income. It wouldn’t hurt to have something on top of your current inflow, right? May we suggest setting up an online business? Did you know the market for bags is growing steadily for the past few years? And it isn’t looking like it’s going to go slow soon. Experts say it’s going to grow further into the next decade. Based on the compound yearly growth rate, the handbag industry is looking to grow by as much as 5.9 percent until 2022. With the prospect of having an expanding market, wouldn’t it be a nice idea to try your hand in the handbag business? Admittedly expensive bags tend to be very exclusive. Popular high-end brands like Louis Vuitton, Chanel, and Hermes may not be for everyone. Designer handbags may be what every fashion girl wants, but unfortunately their prices may seem restrictive. Thus, selling these high-priced items may entail a higher capital. More importantly, these brands also tend to carry a higher risk of incurring liabilities should the customer skip making the payments after getting the item. If you’re looking for minimal risk and reduced capital requirement, perhaps you might be interested in selling tote bags. It’s a practical choice for practical women. You’ll surely make good money out of these items. You might wonder why tote bags when you can get bigger profit yield by selling expensive designer bags. True enough, you get to earn more with the high-end brands. The downside, however, to this is you need to have a bigger capital to get your items from the supplier. As they say, spend money to make money. Wondering what sells better? Is it the tote bag or the high-end designer variety? Quantity wise, it would be the tote bag. It’s considerably inexpensive compared to the Hermes, Louis Vuitton, and Chanel items. Which is why many people see the tote bag as a practical alternative to their pricier high-end brands. With a fast-expanding market and with holidays around the corner, now is the best time to get started on your tote bag business. It may be nerve-wracking at first (just like what any other newbie feels when breaking into business). But you have to start somewhere. And what perfect item to start your business with than with a tote bag. It’s less risky compared to the expensive items. Perhaps start with this humble product at first then expand later on with luxury purses and designer brands. When starting your brand, think of what personality you’re trying to convey. Since your niche is with tote bags, perhaps a fun vibe is an appropriate feel. Some enthusiasm in the design too, perhaps. May we also suggest a more casual feel in its labeling? If you have something in mind already, it’s time to set it on your tote bags. Let’s move on to advertising your wares. Here, your objective is to make your brand and items known to your target audience. Thus, it is essential that you give them a clear picture of what your tote bags look like. For this reason, you’ll need tote bag mockup templates. Looking for cost-effective ways to package your brand for advertising or marketing purposes? Then tote bag mockup templates are your practical solution. Here are among the many reasons why. Instead of spending money for a camera, decent lighting, and some models, why not get a set of tote bag mockup templates? Wouldn’t that be a sensible alternative? It won’t cost you much (in fact, there are a lot of tote bag mockup templates that you can download for free). What’s more, it may take considerable time and effort to shoot some photos and edit them for polished finish. Then after the photo shoot, you may need to clean up the images and what not. Isn’t that more impractical? So why not use tote bag mockup templates? Using tote bag mockup templates is simply a better option. It’s more cost-effective, efficient, and truly a wiser use of time, energy, and resources. 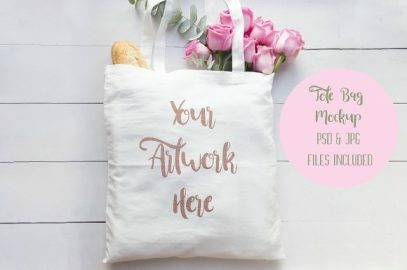 Tote Bag Mockup Templates You Can Download at Little Cost! 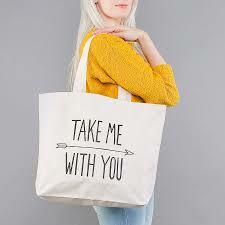 Are you looking for the popular medium to design your tote bags for advertising purposes? Then you’ll love what we have in store for you here. We’ve gathered some of the best tote bag mockup templates. What’s great about this collection is that you can get them at an affordable price. The Tote Bag 2 Mockup Set by Creatsy are layered PSD file that you can edit and prepare for your customized design. This collection features file specs of 2200 x 2200 px 300 dpi. You can change the colors, design (via smart objects), and gradients. While there are flowers included in the pack, you can remove them. 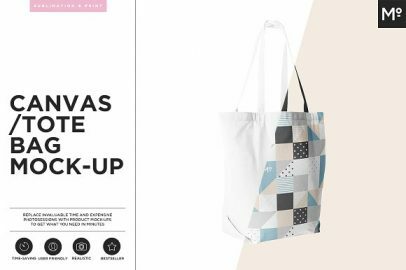 These tote bag mockup templates have custom, neutral, and white backgrounds. They’re Amazon ready too. You can get the Tote Bag 2 Mockup by Creatsy for $12. 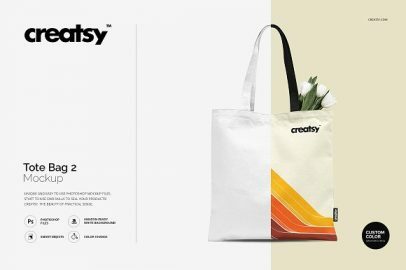 Just like the one mentioned above, the Tote Bag 2 Mockup Set is also by Creatsy and features changeable design (via smart objects) and colors. The pack includes 8 PSD files, with specs of 5000 x 5000 px 300 dpi. All of which are Amazon ready and with custom, white, and neutral backgrounds. 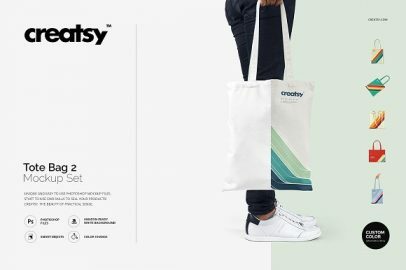 Looking to buy the Tote Bag 2 Mockup Set by Creatsy? You can get it for $15. Time is gold. 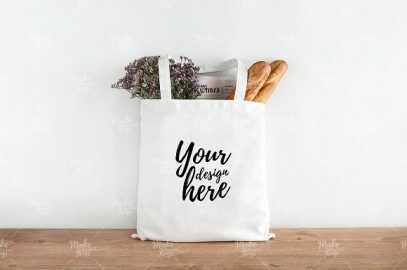 Instead of trading your precious time with expensive photo sessions and image editing, perhaps you can use quick and easy tote bag mockup templates. Here’s another good one from our picks. The Canvas / Tote Bag Mockup features 4 PSD files that you can use as great selling tools. This pack allows you to pick your preferred colors and edit the elements. The design parts come in front, back, and handle view. It has a white background with realistic effects. You can buy it for $10. This wonderful pack contains a JPG file and a layered PSD file with smart object, allowing you to change colors and edit your design with ease. The Tote Bag Mockup #0620 is available for $9. Want to display the artwork on your product? Check out this awesome pack by WanderlustLens. The Tote Bag Mockup includes a photo of a cute, cotton tote bag. The high-res image is perfect for your website, online shop, or blog.